The thistle is the Flower of Scotland; hardy, undemanding and prickly. This seems an apt symbol of old-time Scottish peasants, who survived for eons farming and foraging on this often inhospitable northern land. 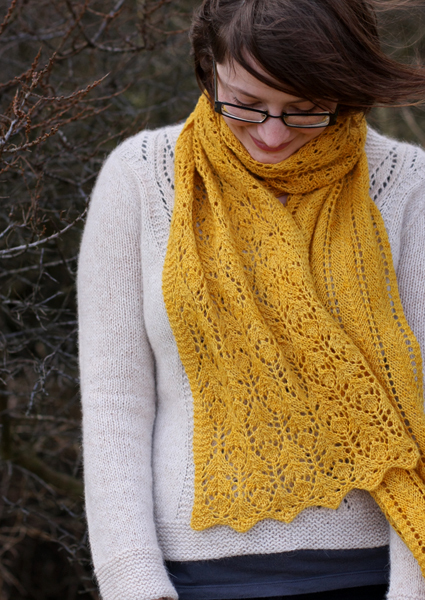 Thistle is a simple and classy scarf which can be easily adjusted to make a wider stole or a throw blanket, and may be knit in any weight of yarn. The thistle pattern is available as an individual pattern download, or as part of Handmade in the UK. sizing In 4-ply yarn at suggested gauge, the stole will measure about 12" wide by 80" long, depending on how aggressively you block the lace. To adjust width, add or subtract a multiple of 10 sts. notes Lace pattern is described in line-by-line written instructions, and also shown by a chart. Lace is worked on right side rows only, wrong side rows are simply purled.